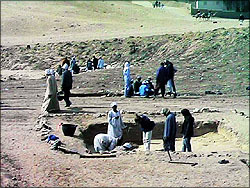 The past three days have seen hectic activity at both the excavation site and in the storeroom to prepare for digging on site in the morning. After moving most of the modern sand that covered the site, our primary concern was to locate as precisely as possible the corner pins of our previous season. 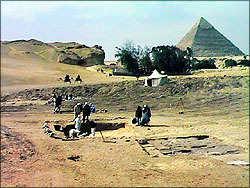 Once these were uncovered, more modern sand was removed in the general vicinity of the areas in which we might wish to dig later in the season. Such foreplanning is necessary due to the intensive labor required to move this much earth. Later, when careful excavation calls for more precise work, and fewer people, some of the workers can go back to clearing backfill from other areas of the site. After we removed the backfill from the three five by five meter "squares" (excavation areas in the shape of a square, precisely defined by iron stakes set five meters apart) which were excavated in 1995, Carl Andrews, team photographer and computer guy, Noubie Abdul Baset, surveyor's assistant, and Dr. Lehner used the new Sokkia theodolite to lay out the new squares to be dug this year. These new squares run along the projected path of the southern wall of the large building used for bread baking and fish processing. It is in these squares that we hope to find either the continuation of this large, meter-and-a-half wide mudbrick wall, or its corner, to help determine the overall size of the building. Other areas which may be excavated this season were also laid out using the theodolite. 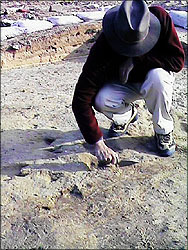 These include areas following the north-south extension of the mudbrick wall (remember that we are working away from the southeastern corner of this enclosure wall, which was discovered in 1991), as well as a square some distance to the northwest, closer to the center of the area which may be enclosed by the wall. However, it is in the squares which we will be opening tomorrow where we hope to find out how far west the southern wall runs. At the storeroom two procedures have been underway, in addition to the never-ending task of organizing our new space. The most important work has been processing the back-logged pottery from the archaeological layer (or, what our project calls a "feature") which was discarded by the bakeries when they were in use. By processing this massive (more than 1000 kilograms) amount of ceramic, we hope to determine what kinds of activities were carried out, and for how long. As it now stands, most of this pottery has been sorted, but much more detailed analysis has yet to be done in the afternoons to come. In addition to this pottery sorting the "heavy fraction" from all our previous seasons has finally been sorted as well. The "heavy fraction" consists of the largest objects which are strained out from soil samples as they are processed by our paleobotanist. Wilma Wetterstrom, our paleobotanist in 1988-1989 and 1991, ran these samples, mixed with water, through a series of finer and finer mesh sieves, to extract the seeds, pollen, and grain left behind. This evidence not only gives us clues as to how our archaeological features were deposited, but also tells the story of the ancient environment. The large objects contained in the "heavy fraction" can be bone, worked flint and mud sealings. Sealings are pieces of the fine, clean mud which the ancient Egyptians used to seal up their pottery jars, basket boxes and doors. In the Old Kingdom, they would roll cylindrical pieces of stone, inscribed with hieroglyphs or designs, over the mud when it was still wet, leaving behind written impressions. When this mud dries, it becomes so hard that it does not dissolve, even in our flotation machine. The words and designs left on these sealings help us to assign a date to our site. Until today, all the excavators have been spending their days in the storeroom. Beginning tomorrow, we will excavate in the mornings, and will spend our afternoons working in the storeroom.